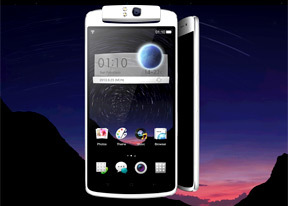 The Oppo N1 comes with Kingsoft Office preinstalled. It's a pretty powerful office editor that can handle Word docs, PDFs, Spreadsheets and Presentations. It can link to cloud storage, email files, create a shared view with other users and more. There's editing enabled too so you can get some work done on the go. The calendar app has three views that you can swipe between. First is the Year view, which aggregates all 12 months with all of their days, a month view, which has little red dots for events and the agenda view, which is a vertically scrollable grid of events. Sadly year view doesn't show little dots for when there's an event, despite the screen being large and high-res enough to allow it. Creating an event is pretty straight-forward - you just hit the New event toggle in month and agenda view and start choosing the name, if it's a birthday memo, dates and times, the time zone and you can add reminders. Behind a Show more options tab you'll find repeat, account to where you'd like to save the event , locations, availability info (busy, free, etc.) and privacy. There's also Google Calendar preinstalled on the Oppo N1 if you prefer a cleaner, simpler look and feel. The calculator is pretty simple to use - it has big, easily thumbable keys. In order to bring up the advanced functions (trigonometry, square root, brackets, etc.) you just turn the app in landscape. The Notes app lets you create complex notes with text, images and hand drawn notes. You can even set a password for your notes. The Tools folder is preloaded with a few apps that you usually get from the market. There's a Flashlight app (that's virtually similar to the HTC app), a sound recorder and a 3D compass. There's also a backup and restore app, which does just that - it backs up your Oppo N1's data, settings and apps. You can schedule a backup, choose to backup multimedia files, etc. You can later restore your backup but you'll need to export it first as the app doesn't auto upload the backup to cloud services (like HTC's or Samsung's does). The O-Cloud app looks like it can only backup your contacts, text messages and find your phone. There doesn't seem to be any real storage here or even a connection between the backup and restore app and the O-Cloud app. Perhaps it's a work in progress. Overall the Oppo N1 has its organizing needs duly covered. However if you find yourself in need of another cloud storage options (Dropbox, Google Drive, Skydrive, etc. ), office editing (QuickOffice, Google Drive, etc. ), note taking app (Evernote, Springpad, etc. ), etc. - you can get it more often than not for free from the Google Play store. The Oppo N1 comes with a GPS receiver, which took little under a minute to get satellite lock upon a cold start. You can use the A-GPS functionality to get near instantaneous locks. Alternatively, network positioning will also do if you only need an estimate of your location. Google Maps uses vector maps, which are very data efficient. The latest version has a somewhat easier to use interface for caching maps - you pan/zoom around until the desired area is in view and choose "Make available offline" from the search bar (after you've scrolled past search results or prompts). You can later view cached areas and delete ones you no longer need. Note that there's a limit to the size of the area you can cache - you can't just make all of Europe available offline, not even a whole country. We managed to cache Berlin and some surrounding regions before Maps told us the area is too big. Also, there's no address search in the cached maps and you can only cache map data in supported regions of the world. The Oppo N1 has access to the latest Google Play store. You get to your account, My Apps, My wishlist and parts of it through a side-swipable menu ala Google+.